Pour Concrete is a trusted foundation contractor of Toronto. It understands that every concrete structure develops cracks over a period of time. They are caused due to general settling of the structure, hydrostatic pressure, thermal movement, etc. But, you should not worry about every crack in your property. Many fine or hairline cracks pose no risk to the structural integrity of concrete. It is the larger cracks that require your attention. If you observe larger cracks, usually 2-8 mm or larger, you need to address the problem as soon as possible by calling an expert concrete repair contractor of Toronto. It is because such cracks continue to widen and cause water leakages. 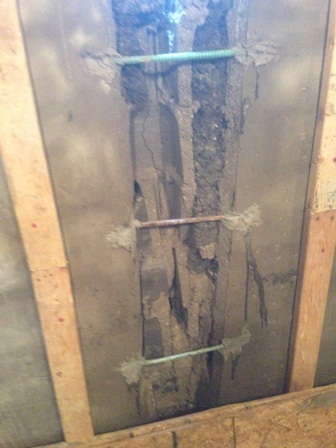 In such a situation, Pour Concrete suggests reinforcement of concrete with rebar staples. What are Concrete Rebar Staples? Concrete rebar staple is a piece of metal that bridges the concrete cracks and holds the two separated pieces of concrete together. The team of Pour Concrete relies on the concrete rebar staples to strengthen the concrete structure of homes, office, factories, etc. in Toronto. Why choose Pour Concrete for repairing Cracks with Concrete Rebar Staples? Pour Concrete uses high quality concrete rebar staples. Our team is able to manage the weight and pressure of large slabs of concrete. Do not worry about other smaller cracks near the existing cracks. The concrete rebar staples take care of them by holding them together. Pour Concrete doesn’t cut corners while repairing concrete cracks. Its insured crew works hard to provide you long-lasting results. Contact the company for concrete rebar stapling in any property of Greater Toronto Area. Call on 647-368-6206 or submit your requirements online.